Quick overview A potent pathway to self-awakening that will help you to live your greatest life and claim the happiness, prosperity and inner peace that you deserve. From the author of the international bestseller, The Monk Who Sold His Ferrari. A potent pathway to self-awakening that will help you to live your greatest life and claim the happiness, prosperity and inner peace that you deserve. 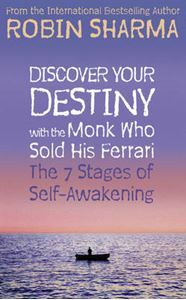 From the author of the international bestseller, The Monk Who Sold His Ferrari. * The Monk is back with a visionary new book on awakening your authentic greatness, full of fresh and exciting new lessons to stimulate your life. * Combining Eastern wisdom with Western success principles in this deeply inspiring, yet highly practical guide, Robin Sharma offers a blueprint for living a beautiful life, rich with joy, prosperity and lasting inner peace. * This fable follows the story of Dar Sanderson, a middle-aged human resources manager with a good job, nice home and steady income. Despite his apparent success, Dar is deeply unhappy, realising that his good life is keeping him from his best life. After encountering the Monk, he embarks on a 6-month odyssey to discover his authentic self and reclaim the life of his dreams. Along the way he learns the 7 stages every person must choose to walk if they wish to seek a life of lasting happiness and personal freedom. * Robin Sharma is renowned for his captivating story-telling, which has earned him fans including the master of spiritual fiction Paulo Coelho.